One of my favorite things about summer is finding strawberries at the farmers’ market. The growing season in Colorado is a bit shorter than some places, so our strawberries don’t appear until a little later, but when they do, I’m ready! When choosing strawberries, look for a deep red color, and be sure to give them a whiff. They should have a nice strawberry smell. At most farmers’ markets, you should also be able to sample a few berries before you buy. And be sure not to wash your strawberries until you’re ready to eat them. They’ll soak up all that water and will quickly turn soft and mushy. 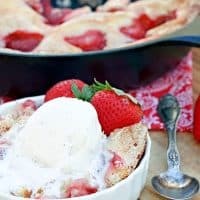 I’m a big fan of finding simple but delicious ways to use my farmers’ market produce, and this Simple Strawberry Cake is the perfect way to show off fresh, in-season strawberries. 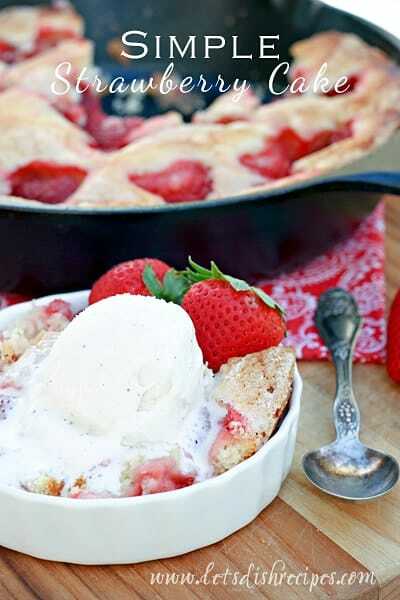 I like to bake mine in a cast iron skillet, but a pie pan will work just as well. This cake is delicious as-is, but I highly recommend serving it warm from the oven with a scoop of vanilla ice cream. Preheat oven to 350 degrees. Butter a 10-inch pie plate or cast iron skillet. In a medium bowl, whisk together flour, baking powder, and salt. With an electric mixer, beat butter and 1 cup sugar on medium-high speed until pale and fluffy, about 3 minutes. Reduce speed to medium-low; mix in egg, milk, and vanilla. Reduce speed to low; gradually mix in flour mixture. Transfer batter to prepared pan. Arrange strawberries on top of batter, cut sides down and as close together as possible. Sprinkle remaining 2 tablespoons sugar over berries. Bake for 10 minutes, then reduce oven temperature to 325 degrees. Bake for an additional 40-45 minutes, or until cake is golden brown and firm to the touch. Cool slightly on a wire rack. Serve warm topped with vanilla ice cream.